Showing results for tags 'l-mount'. Sigma today announces eleven ART lenses for Leica L-Mount. Here is the full list: 14mm F1.8 DG HSM | Art 20mm F1.4 DG HSM | Art 24mm F1.4 DG HSM | Art 28mm F1.4 DG HSM | Art 35mm F1.4 DG HSM | Art 40mm F1.4 DG HSM | Art 50mm F1.4 DG HSM | Art 70mm F2.8 DG Macro | Art 85mm F1.4 DG HSM | Art 105mm F1.4 DG HSM | Art 135mm F1.8 DG HSM | Art﻿ Sigma today announces that a total of eleven Art Series full-frame L-Mount lenses will be launched in the near future. According to the manufacturer, these lenses all have a high-speed autofocus which is fully compatible with the AF-C mode. In addition, there is also compatibility with the camera stabilization as well as the correction of e.g. chromatic aberrations in the camera. The lenses presented today are all fixed focal lengths. With the release of this lens series, L-Mount users will be able to cover the focal length range from 14 mm to 135 mm with fixed focal lengths. The most important features of these lenses are: Optimized Autofocus for L-Mount The complete package of camera and Sigma lenses will benefit from the "AF Drive Control Program" and the "high-speed Communication". The speed and precision of the autofocus are optimized by better communication between the components. Compatibility with Camera Stabilization The camera recognizes and considers the focal length of these Sigma optics and optimizes the image stabilization accordingly according to the manufacturer. Compatibility with In-Camera Aberration Correction The camera takes into account the characteristics of the lens in terms of distortion or aberrations. According to the manufacturer, this should have a positive influence on the prevention of chromatic aberrations and distortions, for example. Native Lenses Ensure Stable Handling By using the native L-Mount lenses, photographers do not need to resort to adapters. In addition to the more stable feeling in handling, the lenses feature an even better fit, better durability as well as optimized dust and splash water resistance. The lenses are part of the "Sigma Mount Conversion Service" program. The availability and prices for the eleven L-mount series lenses will be announced later. Mit dem neuen APO-Summicron-SL 1:2/35 ASPH erweitert Leica sein Objektiv Line-Up um eine klassische Reportagebrennweite für Leica SL Systeme. Laut Leica Soll das Objektive unter anderem aufgrund innovativer Fertigungsmethoden und neu eingesetzten Technologien, die neue Referenz unter den Reportageobjektiven sein. Das Objektiv besitzt vollkommende Kompatibilität zu anderen Kameras der L-Mount Alliance. 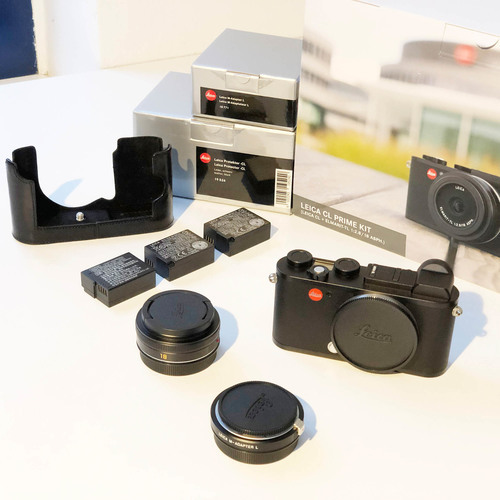 Neben der besonders starken Abbildungsleistung, welche auch schon bei voll geöffneter Blende laut Leica hervorragend sein soll, sorgt die Konstruktion sowie das Design des Objektives für kompakte Maße sowie ein geringes Gewicht. Leica betont, das bei der Entwicklung des Objektives ein besonders Augenmerk auf die Vermeidung von Streulicht sowie Reflexen gelegt wurde. Durch hochwertige Beschichtungen ist es laut Leica gelungen diese auf ein geringstmögliche Maß zu reduzieren. Das APO-Summicron-SL/35 ASPH ist auch bei widrigen Wetterbedingungen bedenkenlos einzusetzen, da es über Staub- und Spritzwasserschutz verfügt. Es wird ab April 2019 zu einer UVP von 4.400,- € im Handel erhältlich sein. sieh' da: https://www.photoscala.de/2019/02/01/panasonic-praesentiert-kleinbildspiegellose-lumix-s1r-mit-47-megapixel-und-s1-mit-24-megapixel/ bis zu - 10 °C ?!? From Dpreview, based on Photokina 2018 (https://www.dpreview.com/interviews/5734204427/photokina-2018-interview-leica-sigma-and-panasonic-talk-l-mount-alliance).